A new browser-based Shadowrun game is in the works with none other than original designer Jordan Weisman helping out with production. It's been a few years since the last time we saw a Shadowrun videogame, that being the thoroughly mediocre Xbox 360/PC shooter that came out in 2007. Hopefully things will go a little better for Shadowrun Online, a browser-based online game currently in pre-production at Cliffhanger Productions. Full-on development is scheduled to start next month and Cliffhanger is doing its best to keep expectations reasonable. "It will be a decent quality, but it won't be what some call AAA. The reason for that is simple: we are doing a browser based game," the studio explained in the first Shadowrun Online newsletter. "This means anyone can access it at any time from their PC, no downloading, no hassle. But that also means we need to limit visuals. I hope you agree that gameplay is king, so we think the visuals are decent enough." Because it's so early in the process, the nature of the game is still very fluid, but it will be broken down into two major components: the action map, where missions will be carried out, and mission preparation, which will take place on an overview map of the city and involve using contacts, skills and resources to gain information about the upcoming job, bribe guards, prepare spells and so forth. It's not much to go on but the presence of Jordan Weisman, who Eurogamer said is assisting with development, is bound to make fans happy. Weisman is the founder of RPG giant FASA and its videogame counterpart FASA Interactive, both now sadly defunct, and one of the principal designers of the original Shadowrun role-playing game. 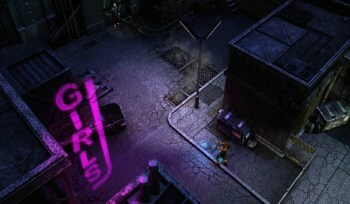 Microsoft licensed the rights to Shadowrun, along with the Mechwarrior and Crimson Skies properties, to Weisman's Smith & Tinker startup in 2007. More information about the new Shadowrun game, including the unequivocal statement that "it is nothing like the Xbox game," can be found at "The Big Shadowrun Online Question/Answer Thread" on the Cliffhanger forums.